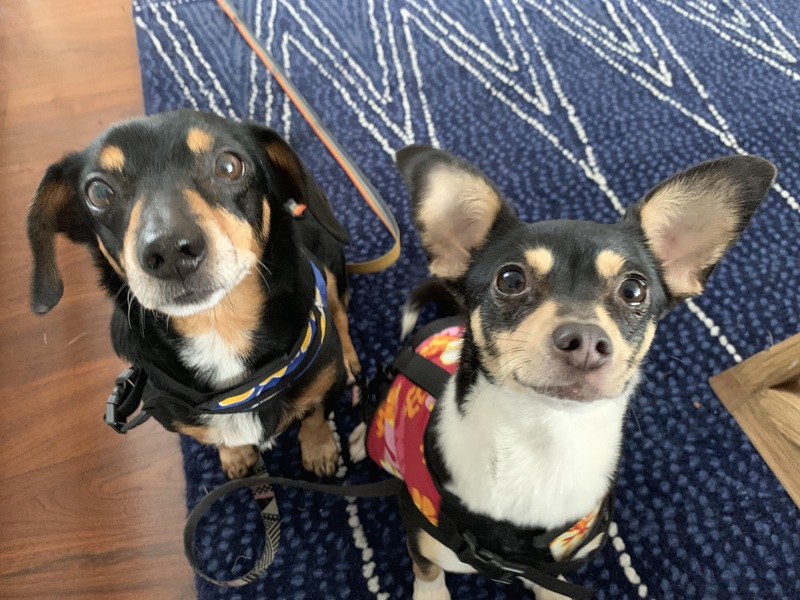 For this Venice Beach dog training session, we teach 6 year old Dachshund mix Keanu to target my hand and share other tips to stop his nipping and aggressive behavior towards guests who move in his home since 3 year-old Chihuahua / Rat Terrier mix Moana joined his family. Before this session the guardians had enrolled the dogs into a board and train program and as many do, this program utilized shock collars, choke chains and other punishment based methods to stop the dog problems. Fortunately for Keanu and Moana, the guardians recognized this was not a positive experience and looked for another option. That’s where we came in. Reputable dog trainers no longer uses force and punishment to teach and train dogs. After all, the title is dog trainer, not dog punisher. Sadly, many dog trainers still use these confidence crushing tactics which almost always lead to other issues, often worse than the original dog behavior problem. If you hire a dog trainer or Venue dog behaviorist and they want to use a pain or discomfort based device, ask them for another approach or find someone else. Positive dog training is far more effective as it builds up confidence instead of hammering away at it. Keanu nipped at my shoe laces when I arrived for the session, and when I disagreed, Moana started barking which amped up Keanu who then started to nip at my ankles. This was a theme for much of the session, Moana got vocal, Keanu started getting stressed and reacting. One of the problems the dogs had was Moana starting fights with Keanu when she couldn’t get what she wanted. This is called redirected aggression and can lead to serous dog fighting. Although Keanu isn’t reacting the same way now, Ive seen many cases where things escalate and the attacked dog starts biting back. Since he is considerably larger than Moana, this can easily lead to a very bad situation. I shared a number of dog behavior tips and secrets like incorporating and consistently enforcing rules. This is a great way to help the dog start to see and respect the humans as authority figures. Its also important as many of the dog fights happened when Moana was on the couch and Keanu came close. By eliminating this status location and keeping he dogs away from humans with high value items like food, the other dog when eating, etc, many of these conflicts can be eliminated. As a Los Angeles Dog Behavior Expert, I frequently talk to my clients about habituation, where the dog learns a new behavior by being immersed in it. Often this is by staying with other dogs, but it can also be achieved by having the dogs not engage in that behavior for a long enough period of time. So they longer the dogs go without Moana starting a fight, the less likely future fights will occur. I also went over my petting with a purpose and passive training methods so that they can start motivating the dogs to offer desired behaviors instead. Next I showed the guardians a focus exercise as this is a great way to redirect the dog’s attention before a fight breaks out. After coaching both guardians through the focus exercise I went over a hand targeting lesson. You can learn to teach your dog to target your hand with their nose by watching the free dog training video below. I went over this hand targeting command to help the dogs practice touching hands as its a nice interaction, but also because one of the guardians repeatedly physically moved the dogs into position. She wasn’t doing anything aggressively, but since dogs have an opposition reflex, she was triggering a natural push back reaction from the dogs. This can easily contribute to other dog behavior problems so teaching the dog to move to where you want is always a good plan. Another issue will be stopping the dogs from getting over excited. While we were filming the roadmap to success video below, one of the guardian’s parents arrived which caused both dogs to get super excited and start barking. I tried to wait it out, but they refused to stop barking. Eventually I asked the person to leave so we could finish the video, but this highlighted the need for the humans to IMMEDIATELY stop petting or engaging with the dogs the instant they start to get excited. If the humans consistently avoid petting or interacting with the dogs during exciting times like when people arrive, feeding time, etc, they will find the dogs stay calmer, listen better and start fights less often. To help the guardians remember all the tips I shared in this Venice Beach in home dog training session, we shot a roadmap to success video that you can watch below.